Our Triple Initial Necklaces are new to the collection and are quickly becoming a new favourite. This necklace makes for the ideal thoughtful gift for that someone special in your life, whether that be your sister, mum, wife, girlfriend, best friend, daughter, god daughter… and so on. Show them just how much they mean to you with a personalised gift that carries great meaning with this Triple Initial Necklace. Even if she already has a necklace collection, this piece is sure to become a firm favourite and treasured piece that she is sure to fall in love with and treasure forever. 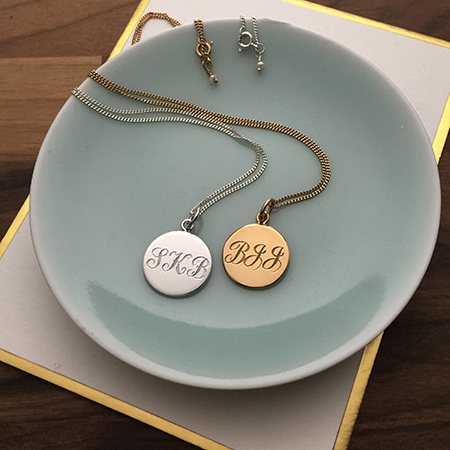 Triple Initial Necklace allows you to choose multiple initials to be hand engraved in a classic pretty scrolled style on a single disc. This necklace is available in sterling silver, 18ct Yellow or Rose Gold Vermeil, to suit all preferences of precious metals. A perfect personalised gift for any occasion, especially special occasions, whether that be birthdays, anniversaries, graduation, Valentines day and Christmas, because she deserves the best. Make the necklace all about her, and get the initials of her first name, middle name and surname engraved, a monogrammed personalised necklace just for her, put her name on it – literally! A sure option that she will love. But perhaps you would like something slightly different than the obvious choice in personalisation? Here are some suggestions to help to inspire you on different initials you could choose to be hand engraved. For a newly wed or wife, celebrate that she’s now a ‘Mrs’ with her first and second initials and the initial of her new surname. Beautifully scrolled initials that are entwined together, celebrating the union of their or your marriage. Or create a memento of family love, and perhaps have the initials of you and your siblings, or if a gift for a mum, have the initials of her children hand engraved. Celebrate the closeness and love you and your family have for one another. The ‘Love You More’ necklace was fabulous and gratefully received. A Massive hit!